Mary Barr, author of “Friends Disappear: The Battle for Racial Equality in Evanston,” at an event Thursday. Barr spoke about the legacy of racial segregation in housing and education in Evanston. Even as the Evanston/Skokie District 65 School Board and Evanston City Council swore in historically diverse bodies on Monday, the author of a book criticizing Evanston’s history of racial segregation said there is still a lot of work to be done. 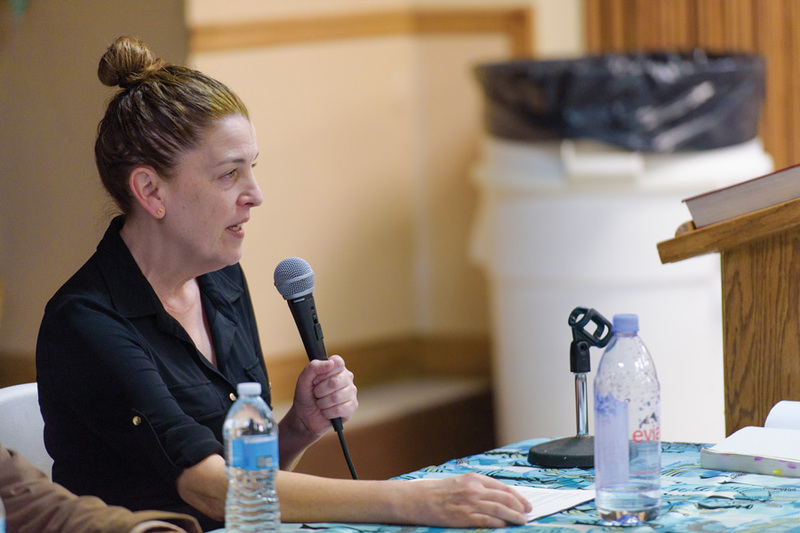 Evanston native and Clemson University sociology Prof. Mary Barr, author of “Friends Disappear: The Battle for Racial Equality in Evanston,” spoke about the legacy of racial segregation in housing and education in Evanston at an event Thursday hosted through the Evanston Literary Festival. Barr spoke at the Second Baptist Church, 1717 Benson Ave., to about 80 people in a conversation moderated by Northwestern sociology Prof. Al Hunter. As the sounds of gospel music drifted down from the floor above, Barr noted that the location of the event was particularly relevant. Second Baptist Church was the one of the first black churches in Evanston, established in 1882. “The date is important; it tells us that black people were a vital force in building this community from the very beginning,” Barr said. While writing her book, Barr said it was important to start at the beginning of the history of social rights in Evanston. Barr said she learned about the fight for racial equality and integration, especially in regard to public schools during her research. Barr said while growing up, she didn’t realize Evanston was as segregated as it actually was. She said it’s “strange” to think of the civil rights movement in a city like Evanston, as much of what history recounts are the stories of inequality in the South. Evanston resident Tracey Wallace said during the open discussion portion of the event that the city suffers from “drive-by diversity” — Evanston appears diverse from the outside, but still struggles with racial divides. Barr began researching the issue of racial disparity after she found a photograph of her and several friends from when she was younger. Of her seven black friends in the photo, she learned that only two now have a stable income and secure housing. Four of them had died before they turned 40 years old, she said. “Close interracial friendships were made, but those don’t negate the huge racial disparities in housing, education and work,” Barr said. She said geographic segregation made it difficult for children to make friends of different races because they lived far from each other. Barr said the wards closer to Lake Michigan are historically white, while wards in west Evanston are historically black. Because of the rising price of housing in Evanston, Barr said, black families are often unable to continue live in the city. Dorothy Headd, an Evanston resident and crossing guard at a District 65 elementary school, said she has noticed that even today, white and black children don’t play together. However, she said she believes there is still hope for the future.